The 10 Best Bagel Shops in Arizona! 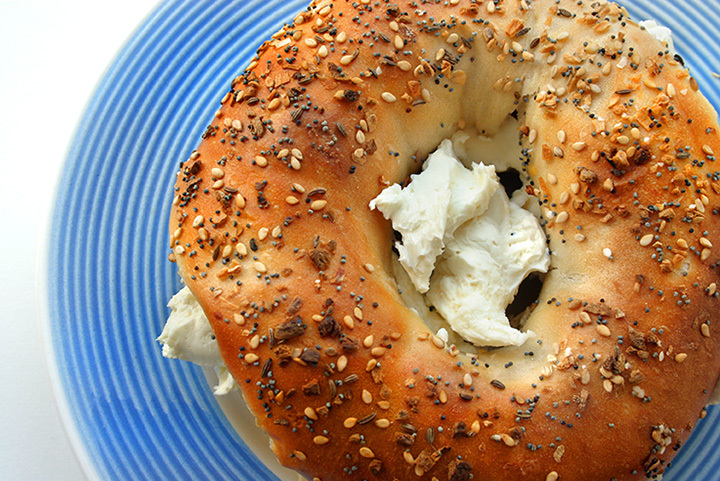 In the pantheon of best breakfast foods, bagels are oft forgotten. Eggs, bacon, and pancakes seem to get all the love. There’s no denying the appeal of a farm breakfast. Still, bagels deserve more respect. These little hand-sized rings of bread are delicious in their own right. Bagels are a breakfast treat whether you’re on the go, craving lox, or just looking for an excuse to feast on cream cheese. Here in Arizona, there are more than a few bagel shops for any such occasion. Here are the 10 best. Do you know the bagel man? Though he doesn’t have as much notoriety as, say, the muffin man, the bagel man is quickly becoming one of Phoenix’s most beloved figures. Located in the Phoenix suburb Ahwatukee, The Bagel Man was opened by New Jersey transplant Kal Salih. He’s brought his East Coast bagels to the Valley and offers hungry customers favorites like homemade cream cheese and hot breakfast sandwiches. The freshly dough bagels come at a good price too. You can get a bagel for $1 or a baker’s dozen for $10. Chompie’s has been a Phoenix favorite since 1979. That’s when the Borenstein family moved from Queens, New York and opened “Chompie’s Bagel Factory.” This New York-style deli has expanded their menu and in the process opened four additional locations. Still, they’re all about the bagels. You can enjoy one of 22 bagel flavors, 13 cream cheese flavors, or four bialys on a given trip. Chompie’s also has a little something for seafood lovers. They sell lox, smoked salmon and smoked whitefish all day. The signature dish is the all salmon half and half bagel. It’s a split bagel with cream cheese covered in salmon and garnished with Nova lox, cucumber, red onion, tomato, olives, and caper. Lox, Stock & Bagel is like a neighborhood bagel shop you’d find in New York. This small breakfast spot is all about bagels, lox, and coffee. The bakery serves 28 different flavors of bagels including onion, sun dried tomato, cheddar jalapeño, and cinnamon raisin. While the bagels hold their own, the extras are what really shine. They have a wide selection of smears including veggie cream cheese, Nova spread, and hummus with chopped liver. The strong coffee, tasty lox, and bagel flavors make it easy to come back time and again. New York Bagels ‘N Bialys is an oasis for old-fashioned bagel fans. With original locations in both Chicago and New York, New York Bagels ‘N Bialys dishes up classic Jewish staples to their customers. Since opening in 1987, this restaurant has been making old-fashioned kosher bagels by boiling and baking the dough for an extra thick crust and doughy inside. The result is a delicious bagel served in over 20 flavors. Their flavored cream cheeses, lox, and veggie toppings make for a quintessential bagel eating experience. To complete the experience, New York Bagels ‘N Bialys has a full bar for some breakfast cocktails. The Nosh Café is no longer just a bagel joint. In 2011, the owners decided to expand and bring on a full kitchen. Though their popularity has surged, they’ve remained true to their bagel loving customers. Nosh’s made from scratch ingredients pair well with their southwestern infused menu. Favorites include the bagel breakfast sandwich and lox topped bagel. You can also get the ranchero—a bagel covered in sausage, egg, red onion and house made cream cheese. Biff’s Bagels is a treat in downtown Flagstaff. This family owned bagel and coffee shop combines great service with healthy, fresh ingredients for an all around great experience. Their menu includes over a dozen flavors of bagel and cream cheeses. It’s easy to like the food and even easier to like the business. Biff’s has many vegan friendly options and is committed to using cage-free eggs. Early risers will love their organic and fair trade certified coffee. Biff’s, named after the owners dog, also supports the local no-kill animal shelter and has a full wall of dog pictures. Kokobelli is a find in Mesa. This mom and pop serves fluffy bagels and New York style breakfast sandwiches. Their homemade bagels are available in over 20 flavors and on seven breakfast sandwiches. The real treat is the westerner—an egg sandwich on a cheddar bagel topped with pepper jack, onion, ham and bell peppers. That’s not to mention the deals. Kokobelli’s bagels are so cheap you can get a baker’s dozen for $10. Goldman’s Deli is a traditional Jewish restaurant dishing up Chicago style dishes. That means Goldman’s serves up classic far like chicken chopped liver, matzo ball soup, and hand-made crepes. That also means really good bagels. Goldman’s sells their toasted bagels with cream cheese for just $2.99. You can add some Nova lox, tomatoes, onions and chive cream cheese to your bagel for a legendary start to the day. Mesa’s Bagel Nosh has everything you’d want out of a bagel shop. They have a variety of bagel flavors, including underrated favorites like cinnamon sugar and maple French toast. They have epic bagel sandwiches, like the sunrise with bacon, onion, and jalapeño cream cheese. Their freshly made bread is even made without preservatives. It’s easy to find regulars at Bagel Nosh. Bagel varieties can be added on-demand and they have a punch card system for loyal customers. Plop down with a bagel and some coffee at Odelay Bagel. This New York bagel company uses the East Coast method of bagel preparation. That is, they boil the bagels in malted water before baking them to perfection. Odelay’s also partnered with a local roaster to make some seriously delicious frappes, lattes, and iced coffee. Their unique bagel toppings like peanut butter and cinnamon sugar are a real treat.